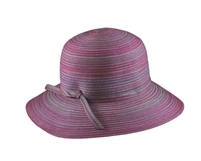 Cotton-blend ribbon bucket or kettle hat with colored stitching throughout. Lace and string tie. Brim can be turned up or down. 30% cotton, 70% polyester. Brim: 4 in. This great sunhat has a real natural look.. The flexible brim can be shaped however you like and this hat can be rolled right up for easy travel.